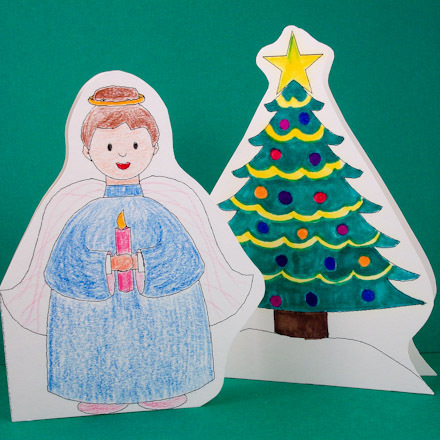 Make simple and fun holiday cards in the shape of a pine tree, Santa, or an angel. 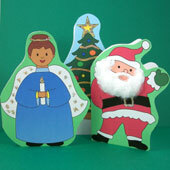 These cards are easy enough for younger children and people with special needs to make. While the cards are very simple to make, they are easily enhanced with glitter, cotton balls, sequins, and other creative touches. Let your imagination soar! Related crafts: For pop-up cards and more easy to make greeting cards, see the projects listed in Greeting Cards Kids Can Make. Choose a card to make. Download the pattern for the card and print it on cardstock. 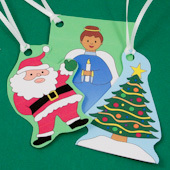 There are three card designs: a pine tree, Santa and an angel. All the designs have both a front and a back, and are offered in color and black & white. 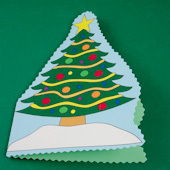 A plain pattern with no tree decorations is available for the pine tree design. While the color patterns are quicker to make, the black & white patterns allow for more creativity. Whichever pattern you use, personalize your cards by adding your own creative touches. Matching envelopes: Choose an envelope pattern and print it on paper. The black & white pattern works well on either white or colored paper. Follow the instructions on the pattern for assembling the envelope. 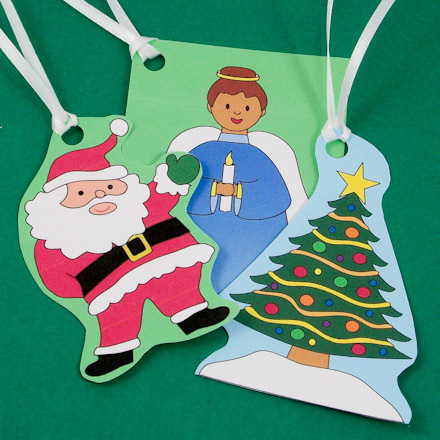 Project Extra: Make gift tags with the same designs as the shaped cards. Punch a hole in the top of the tag for a ribbon tie. Cut rectangular tags or shape them like the cards. Use crayons, colored pencils or markers to add color to the black & white pattern. Add extras to the cards like rosy cheeks on Santa, presents under the tree or clouds beneath the angel's feet. If you make several cards, try to make each one unique. Fold the card in half on the black line in the center of the card. Scoring the fold line will allow easier and neater folding. To score a line, you need a ruler and a blunt tip (empty ballpoint pen). Place the ruler on the line and trace the line with the blunt tip. This makes a dent in the card stock that will fold naturally. Cut straight across the bottom of the pattern on the line marked. Cut from there around the top of the card, about ¼" to ½" (0.5 cm to 1 cm) from the image's outline. Make the cut with gentle curves, leaving a folded "hinge" on the left edge. For Santa, leave a hinge from the bottom of the card to to his elbow. For the angel, the hinge extends from the card's bottom to the left wing tip. For the pine tree, the hinge goes from the bottom to the tip of the lower left branch. 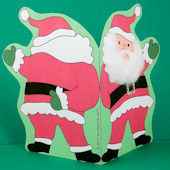 Be sure not to cut through the fold, as it's needed to hinge the card front to the card back. Perk up your card by adding a glitter garland to the pine tree, or maybe tufts of cotton on Santa's beard. Use your imagination! Write a message on the inside of the card. 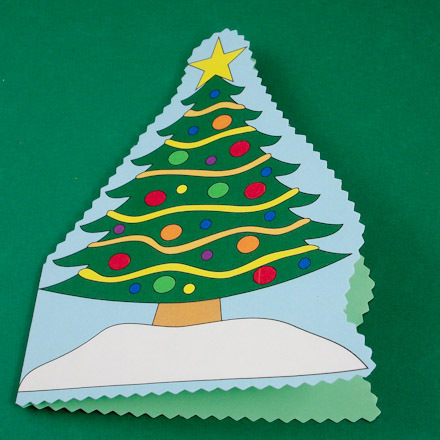 Decorate the inside of the card with images of Christmas: candy canes, ball ornaments, bells, ribbons, etc. That's it! Your Christmas cards are ready to send! Think about the project. Imagine how it will look, and what you will do with it. 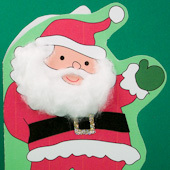 Tip: Add glitter on Santa's belt buckle and cotton on his beard. Project extra: All of the shaped cards have fun backs, too. Tip: Black&white patterns can be colored with crayons, colored pencils or markers. The plain tree allows the most creative freedom. Tip: To make a paper card stronger, make a double thickness by gluing the pattern to a second sheet of paper. You can also cut the cards with decorative-edge scissors. Wishing you all the wonder, joy and peace that Christmas brings. Wishing you all the delights of Christmas! May you discover the magic of Christmas. Wishing you good friends and happy memories!